Moving upward from the photosphere, we encounter the chromosphere. The gas here is very tenuous, compared to the photosphere. Since the photosphere is so bright, it had to be masked off to be able to see the low-density chromosphere. This image of the chromosphere was made by photographing ultraviolet light emitted by ionized Helium atoms. The sun is mostly made of hydrogen. 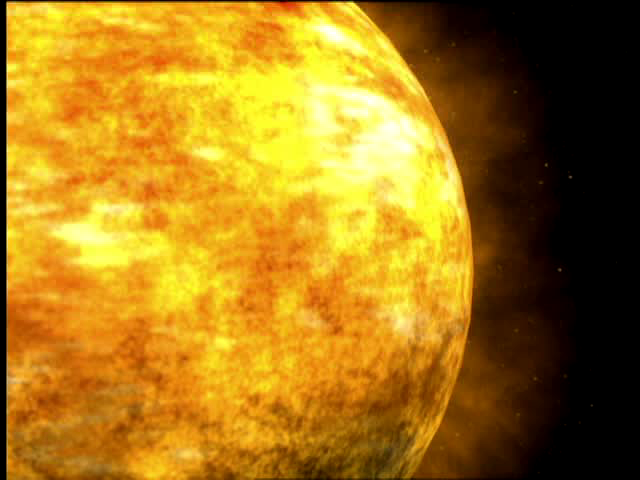 Helium is the next most abundant element in the sun, with all other elements present in trace quantities. This photograph shows structures in the chromosphere known as spicules. They are tube-like structures of hot gas that is flowing upwards very fast, at about 50,000 kilometers per hour. They are formed along the magnetic field lines and show evidence of magnetosonic waves. These waves are pressure waves like sound waves, but are also affected by the magnetic pressure, rather than just the gas pressure like sound waves. As the above graph shows, something very strange goes on above the chromosphere. The temperature rises. Imagine that you have a small hand warmer, wrapped in a scarf outside on a cold day. The hand warmer has perhaps a small battery and heating element. If you bury your hands in the scarf, they get warmer. The deeper into the scarf, the warmer they feel. This makes sense. The temperature drops steadily away from the center toward the cold surroundings. It would be extremely surprising if you felt that outside the scarf, the temperature suddenly got much higher. That is just what is going on here. Instead of getting colder away from the surface of the sun, it actually gets hotter, and not just a little hotter, hundreds of thousands of degrees hotter. This puzzled physicists for quite awhile. We think we have an explanation . We think that there is energy carried up from the surface via the magnetic field that is actually transporting enough energy to drastically raise the temperature in the transition zone and the corona. Now, this is a very strange photo indeed. It looks like light is streaming from the surface of the moon. Actually, it is a total solar eclipse. The moon lies directly between the earth and sun, blocking the bright light of the sun. This allows us to see the faint corona, the outer layer of the sun. Since the corona is very hot, hotter than the gases beneath it, the spectrum we observe from the corona is an emission spectrum. This huge dark hole in the corona was photographed by the SDO probe. It is a region where the magnetic field lines do not quickly loop back together onto the surface, but extend far into space. The solar wind, made of charged particles and photons, streaming from this coronal hole created bright auroral displays on Earth. Sometimes the sun is very active, and large disturbances, or solar storms can happen on the surface. Coronal mass ejections can send large clouds of plasma off of the surface of the sun. Coronal mass ejections are the largest and and most hazardous of the solar storms. The are basically huge bubbles of plasma that rise and break away from the sun and travel off into space at high speed. As you can see from the above comparison, the ejected plasma can be large enough to completely engulf the earth. A coronal mass ejection can cause disruption in our power grids and satellites. What happens to Earth when a coronal mass ejection comes our way? Please watch this video from NASA to find out. Where does the sun really end? You might say that it ends where the solar wind encounters the interstellar material at the heliopause. Beyond this, a huge bow shock is set up where the sun and solar system plow into the material beyond on our way around the galaxy. As you can see from this diagram, our earliest probes are just now reaching the outer reaches of the solar wind. Want a recap? Take this journey that light takes from the time it is created via fusion, outward through the sun and beyond, animation courtesy of NASA.